Felipe Ottoni and José Leonardo Mattos have redescribed the little known, endagered cichlasomatine cichlid Nannacara hoehni Ribeiro, 1918, and have established a new genus, Rondonacara, for this species. This was doubtlessly an overdue step that ends the taxonomic odyssey of this species. A molecular phylogenetic analysis placed the new genus as sister group to Laetacara, from which it is readily distinguished by a unique combination of characters. Melanie Stiassny (American Museum of Natural History) and Elizabeth Alter have described a new Teleogramma species after US president Barak Obama and his wife Michelle Obama; “in recognition of their commitment to science education, development, gender equality, and self-reliance for all peoples of African nations, and their dedication to environmental conservation in Africa and beyond”. The new species, Teleogramma obamaorum, was found in the main channel of the mighty Congo River at the western part of the Pool Malebo in the Democratic Republic of Congo, an area of turbulent and deep waters and of high species endemism. T. obamaorum differs from the four known Teleogramma species, among other many traits, by not having a dorsally depressed head and body, not showing sexual dimorphism (inferred not to be necessary in the dark habitat where they live) and having enlarged sensory pores. The new species could only be discovered during an extreme drought in 2011, which made the otherwise invisible deep rocky areas of the river surface. It has not being seeing since. 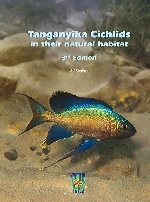 The new edition of the most complete treatment of Lake Tanganyikan cichlids is finally available today! 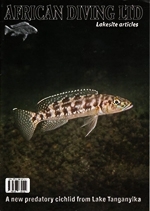 The book covers all the 219 known cichlid species in the lake and includes 1,200 pictures taken in natural habitat. Many taxonomic changes for the lake cichlids are included, they are the result of new information, analysis of the latest DNA comparison test and consult with many of the top lake Tanganyikan cichlid specialists around the world. The book is available through this site or directly from CichlidPress. Apistogramma kullanderi, the largest known Apistogramma yet, has been described in late 2014 in the journal Ichthiological Exploration of Freshwaters by Henrique R. Varella & Mark H. Sabaj Pérez. The holotype of the new species has a standard length (without tail) of 79.7 mm. This feature alone diagnoses it from the rest of Apistogramma species currently described (second largest being A. steindachneri). Additionally, A. kullanderi is diagnosed by a combination of coloration aspects found in males and females. Males A. kullanderi show an irregular and attractive pattern of dark spots and vermiculations on the cheeks and sides with 10-12 dark stripes. The new species was previously known as Apistogramma sp. ‘gigas’, and was discovered in 2009 during the PIPE-Expedition to the Serra do Cachimbo in the upper Curuá river, Xingú basin, Amazon drainage, and is believed to be endemic to a waterfalls isolated plateau in the Brazilian watershed (Central Brazil), where it inhabits clear to light black waters. Geophagus sp. 'aripuanã’, first mentioned as a potential new species by Jens Gottwald in 2011 (Datz 64(n. 2), pp. 36-3), has got the official scientific name Geophagus mirabilis in a recently published paper in the Brazilian journal Neotropical Ichthyology. The description is authored by Gabriel C. Deprá, Sven O. Kullander, Carla S. Pavanelli and Weferson J. da Graça. Type locality and distribution of the new species is established in the upper Rio Madeira, Amazon basin, upstream the Dardanelos/Andorinhas falls in the Matto Grosso state in central Brazil. The new species is diagnosed from the rest of the Geophagus species by the presence of 2-6 black spots in a longitudinal row along the middle part of the flanks in specimens larger than 80 mm standard length (leaving out the tail), and by a rich pattern of iridescent blue, round or vermiculate marks on the side of the head. The beautiful (and unique in Geophagus) coloration of the new species has inspired the specific name mirabilis, which translates from Latin as extraordinary, marvelous, admirable. The holotype and 79 paratypes representing the species are stored in several Brazilian universities. A new species of Julidochromis, Julidochromis marksmithi has been described by Warren Burgess in number 15 of the Polish Tanganika Magazyn. The new species has been widely known as Julidochromis sp. 'regani kipili’, it is endemic to the Tanzanian coast of Lake Tanganyika and has a limited distribution. The species is differentiated from the rest of the Julidochromis species by its coloration, with a bright yellow background and three dark horizontal stripes on the sides, the upper one from the nape to about halfway along the back at the dorsal fin base. The species is described to honor Mark Smith, who was instrumental in providing the type material. With this, Julidochromis counts now six different species and Dr. Burgess has named two Tanganyikan cichlids to honor Mark Smith. A new paper by Caleb D. McMahan and a group of authors has just been published in the journal Copeia. In this paper the taxonomic status of Cryptoheros coatepeque, a cichlid described in 2007 as endemic to Crater Lake Coatepeque in El Salvador is examined. C. coatepeque was described based on morphological differentiations with C. nigrofasciatus, the convict cichlid. The authors were unable to apply the diagnosis given for C. coatepeque to differentiate individuals of Lake Coatepeque, and using molecular and morphological characters found that C. coateque is within the natural variation of C. nigrofasciatus, and hence declare the synonymy of the former. William Albert Bussing Burhaus, 81, professor emeritus of the University of Costa Rica died last Monday (November 17) after suffering a car accident in the pacific coast of Costa Rica, while passenger in a vehicle. Professor Bussing had arrived in Costa Rica in 1960 to research and write his master degree thesis for the University of Southern California. He decided to stay in Costa Rica, where he marred Mirna López Sánchez, also a biologist and professor of the University of Costa Rica. Professor Bussing is better known for his book “Peces de las aguas continentales de Costa Rica” (Freshwater Fishes of Costa Rica). Original news. A revision of the Pelvicachromis taeniatus species group based mainly on caudal fin coloration and mitochondrial DNA comparisons has been published in the journal Zootaxa. The paper is authored by Anton Lamboj, Daniela Bartel & Emiliano Dell’Ampio. In this revision, P. taeniatus has been restricted to the western populations of its previously recognized distribution, in Nigeria and eastern Benin. The restricted taxon is established as distinct from all congeners by a caudal fin which is yellow or white with black blotches and no margin in its half upper part, and with a black margin with a white to pale bluish submargin in the lower half. A new species, Pelvicachromis drachenfelsi, is described for the population in the Wouri River in Cameroon, diagnosed to have a black margin with a white to pale bluish submargin in the lower half of the male caudal fin, not present in any congener but P. taeniatus. The specific name has been chosen to honor Ernst-Otto von Drachenfels from Germany, friend of the leading author. The name P. kribensis has been revalidated from the synonymy with P. taeniatus for the eastern populations in Cameroon (Dehane, Lobe Massa, Moliwe, Muyuka, Kienke) and is established to differ from P. taeniatus and P. drachenfelsi mainly by a male’s tail coloration without black or white margins or submargins. A new publication in the online magazine Zootaxa offers the description of the popular Apistogramma sp ‘papagei’ as Apistogramma ortegai Britzke, Oliveira & Kullander, 2014. The new species is named after Professor Hernán Ortega Torres from the Universidad Nacional Mayor de San Marcos [Lima]. The description, based on a combination on differentiating characters, comprises what had been considered as two closely related species inhabiting together; namely Apistogramma sp. ‘papagei’ and Apistogramma sp. 'pebas'. Albeit the small differences that led to the proposition of the two forms as potentially undescribed species by Ingo Koslowski back in 2000 and 2002, the authors have not found taxonomic differences that in their opinion could justify the proposition of two different species, and have therefore described just one. The new species is endemic to the Amazon drainage in Peru, specifically the upper reaches of the Rio Ampiyacu, from where it is only known. Two new species of Parananochromis, P. orsorum (Parananochromis sp. 'ntem') and P. elobatus (Parananochromis sp 'sanaga') from Cameroon have been described by Anton Lamboj, elevating the number of Parananochromis species to eight. Both P. elobatus and P. orsorum are distinguished from the rest of Parananochromis species by combinations of characters. The specific name elobatus (without lobes from Latin) was given in reference to the short lappets on the dorsal fin in this species. P. orsorum is described after Rose and Tony Orso (Vernon, USA), who helped the author import a number of new species of cichlids over the years. A new haplochromine cichlid from the Great Ruaha drainage in Tanzania has been described by Frederic D. B. Schedel, John P. Friel and Ulrich K. Schliewen: Haplochromis vanheusdeni. The new species is named after Hans van Heusden, who has first documented its ecology and behavior. H. vanheusdeni was previously known as “Orthochromss sp. ‘Sonjo’”, but the authors expressly refrained from placing the species within Orthochromis for it does not fit the current diagnosis of that genus. Furthermore, unpublished molecular data suggest that it is not closely related to the type species O. malagaraziensis. Much rather, it forms a lineage of its own within the haplochromine assemblage. A new species or Lamprologus from the main channel of the lower Congo River in western Africa has been described by Stephanie Tougas & Melanie Stiassny from the American Museum of Natural History in New York. The description, just published in the journal Zootaxa, splits the population of Lamprologus tigripictilis in the lower Congo into two species separated by the Inga rapids. Specimens found in and above the rapids remain L. tigripictilis, while those below the rapids in a stretch of about 100 km are proposed to be renamed Lamprologus markerti, the name given in honor of Jeffrey Markert, who initially suggested the study. The description is based on a diagnosis which includes among a other traits, a slightly smaller number of wider vertical bars than in L. tigripictilis, a reduced number of gill rakers in the first arch and a longer head. The absence of an intestinal loop in L. markerti is also noted. With this description, the species of Lamprologus increase to nine. Alex Ploeg, dutch fish breeder, wholesaler and ichthyologist responsible for the description of twenty five Crenicichla species, who had been Secretary General of the OFI (Ornamental Fish International) since 2004, has tragically been in the company of his wife Edith, their son Robert and his friend Robin on board of Malaysian airlines flight MH17 shot down in eastern Ukraine airspace last Thursday 17 of July. Alex was much appreciated in the ornamental fish industry where he had a large network of contacts ranging from ministers to fish collectors, with whom he shared his vast knowledge of the ornamental fish industry. Our condolences to his family for this terrible loss. A new species of Bujurquina from Ecuador, B. pardus, 18th in the genus and known only from a single remote locality at 220 meters over sea level in the Río Danta in the western Amazon drainage has been recently described in the journal Copeia by Jessica Arbour, Ramiro E. Barriga Salazar and Hernán López-Fernández. The new species is distinguished from all other species of Bujurquina by a pattern of small dark spots arranged in rows along its flanks, whitish hyaline dorsal-fin lappet margins, and a lateral band which reaches the dorsal edge of the caudal peduncle. The new species is closely related to Bujurquina huallagae, also found in the same upper part of the Amazon. The name pardus, meaning leopard in ancient Greek, has been given in reference to the pattern of dark blackish/brown flank spots. The brothers Mikael and Magnus Karlsson of African Diving Ltd recently published the first volume of a new journal they call “Lakesite Articles”. The first volume contains 24 pages with excellent photographs and first hand observations of cichlids of the genus Lepidiolamprologus in Lake Tanganyika. Together with Sven Kullander they recently published a number of descriptions of new cichlids from that lake, and the new journal can be seen as an extension to the official description. The authors explain their views on “their” new species and discuss the validity of another recently described cichlid, Lepidiolamprologus mimicus, which they suggest could as well be a color variant of L. elongatus, at least concerning the Tanzanian populations. As with all of their previous work, the authors speak with authority on Tanganyika cichlids and illustrate their articles lavishly with outstanding photographs, most of them taken in habitat. The magazine can be obtained via the website AfricanDivingLtd.com, and while you are there check out the amazing video clip of rare Tanganyika cichlids. A new species of Chalinochromis, Chalinochromis cyanophleps Kullander, Karlsson, Karlsson & Norén, 2014, has been described in the journal Zootaxa, in circulation today. The new species was initially recognized as such by Patrick Tawil in 2011, who published his observations in Cichlid News Magazine (v. 20, n. 1, pp. 12-19), and suggested the species could be a natural hybrid of C. sp. ‘bifrenatus’ . Later in 2012, the Karlsson brothers Mikael and Magnus identified the species as new in the journal Ciklidbladet (v. 45, n. 2, pp. 15-22) and provisionally named it Chalinochromis sp. 'blue vein'. Ad Konings in 2013 published in the Cichlid Room Companion his recognition of the species, unaware of the Karlsson publication, and provisionally named it Chalinochromis sp. ‘patricki’. The new description honors the initial proposal naming the fish with a specific epithet that in Greek means ‘blue-veined’, referring to the conspicuous blue stripe below the eye in this species. The new species is limited to a 90 km stretch in the southeastern shore of Lake Tanganyika in Tanzania, and it is different from the rest of the Chalinochromis species mainly by the coloration pattern (solid brown to dark grey with a conspicuous blue stripe below eye), which makes it very distinctive in this genus. A new binomial name, Petrochromis horii, is proposed by T. Takahashi and S. Koblmüller for a deep-water Petrochromis caught at Kasenga (Zambia) in Lake Tanganyika. The study includes a large amount of bio-molecular data. The morphometric and meristic data given are sufficient to unambiguously define the new species, especially considering the isognathous jaws of the new species –vs. retrognathous found in other members of the genus (except in P. fasciolatus). Little information is given about the ecology and behavior of the new species, except that it lives rather deep for a Petrochromis (13-15 m or more) and is found sympatrically with several other members of the genus (P. polyodon, P. trewavasae, P. fasciolatus, P. famula and P. macrognathus). The authors cautiously mention that it might be conspecific with Petrochromis “Flame-tail” or P. “Katete”, seen in the aquarium trade. It is very likely that these populations fit the Petrochromis horii diagnosis. Unfortunately, as they are rather drab they are not collected by exporters or fanciers, except perhaps for Petrochromis “Flame-tail” (in which the tail shows an orange hue). Another brownish Petrochromis with isognathous jaws is imported from time to time for the aquarium trade, namely Petrochromis sp. ’Kipili brown‘, which originates from the southern Tanzanian coast of the lake. Despite having a darker brown coloration, this later species could be a geographical variant of P. horii, although as noticed by Ad Konings (personal communication), it always shows a lower bar number (7 below the dorsal fin, vs. 8-9 in P. “Flame-tail”). Additionally, there are two undescribed species which are in my opinion closely related to P. horii: Petrochromis sp. ’gold‘ and P. sp. ’red‘. Despite important differences in adult coloration, all four species are very similar in their ecology and morphology — especially the isognathous snout shape. I have proposed a few years ago to group them in a super-species which I have named the “P. sp. 'gold' super-species”, and which now should be called “P. horii super-species”. Even after many dives around the islands near Kipili, Tanzania, I hadn’t realized that in fact there appears to be two different furcifer-like cichlids present. The recent publication by Kullander et al. (2014) describes a new species that at first sight resembles N. furcifer, and is virtually indistinguishable from that species found all around the lake, but shares the same habitat with N. furcifer at (at least) Ulwile Island. Probably through character displacement the local N. furcifer population at the islands is characterized by a tail fin that has rounded lobes while that of the new species, N. timidus, is forked with long extensions. The tail of N. furcifer at all other areas in the lake is forked (hence its name, which means fork-bearer) and that was the reason divers never realized, when they saw N. timidus at the islands that this was a different species. The observations of the Karlsson brothers (they are co-authors on the paper) clearly state that they found pairs of N. timidus sometimes share the same rocky overhang with those of N. furcifer at Ulwile. This makes it unquestionably certain that N. timidus is a true species regardless of what origin it may have. The description gives a few characters in which they differ from N. furcifer and for me the simplest appears the shape of the pelvic fin. In N. timidus the first soft ray of the pelvic is the longest while in N. furcifer it is the second (or third) ray which gives the fin a more rounded appeal. The pelvic fin of N. timidus appears as a sharp-pointed triangle. There are other differences as you can read in the profile but the shape of the pelvic fin I found the most consistent when evaluating my photos. The paper also uses mitochondrial DNA probes to establish the notion that N. timidus and N. furcifer are not related genetically, but I hope that in the future taxonomists refrain from using this already outdated method of mtDNA phylogenies as they shed no new light on the specific status of an organism and at best may give an indication of the age of the particular gene(s) under investigation. A new Apistogramma species, A. helkeri, the 85th arguably valid Apistogramma species (of 97 formal descriptions) has been recently described by Ingo Schindler and Wolfgang Staeck from the Orinoco Shield in Venezuela (Amazonas state), in the drainage of the Orinoco River. The new species is most similar to Apistogramma hongsloi Kullander, 1979, from which it differs by its coloration and the shape of its dorsal fin. It can be distinguished from all the other described Apistogramma species by a combination of characters. The new species is named for Oliver Helker, who collected and promoted the new species. A. helkeri is described based on two individuals, a weak base for a new species definition but according to the authors not so uncommon in taxonomy, as 19% of all vertebrates are only known for one specimen and 35% of the species have just been collected once. Clearly, more research on this species is necessary but both the authors have a wide and solid knowledge on Apistogramma taxonomy, groups and distribution and so confirmation is a likely event.